Saw 36” diameter logs into wide slabs and boards up to 35-1/2" using accurate and easy-to-use powered saw head controls (forward/reverse & up/down) with the LX150 twin rail portable sawmill! 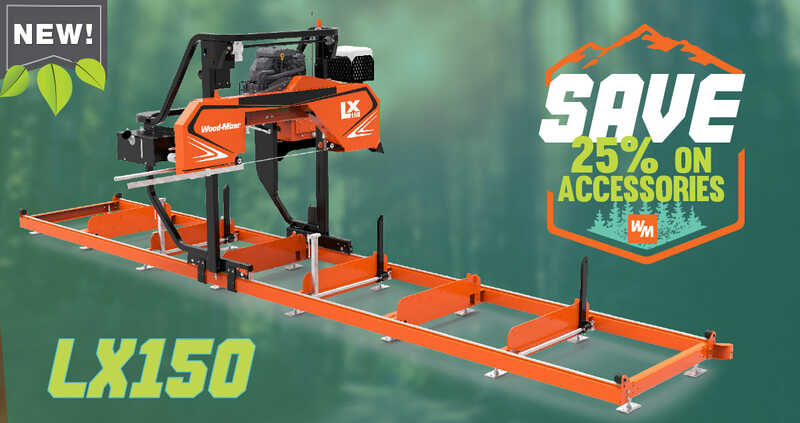 Designed for hobbyists and professional sawyers, the highly durable bed configuration, optional SimpleSet Setworks, and optional Debarker make the LX150 a high performing manual sawmill with features not available anywhere else in its class. Holds the control panel, engine, and the sawmill head in a rigid, stable structure that travels on twin parallel hardened steel rods on the bed. With 35 ½” max width of cut and 11" max depth of cut for sawing wide slabs and boards. Including forward/reverse and up/down for ease of operation and increased production. Adjustment is activated from the control console for operator convenience and precision. Keeps blade properly tensioned for longer blade life and enhanced sawing performance. Turned on and off with a manual valve, lubrication is applied directly to the blade to keep it clean of pitch and sawdust build-up. Are convenient for the operator to charge devices and store items on the control console. Saves two pre-set board thicknesses to quickly and accurately control blade height while referencing from the previous cut. Removes dirt and bark from the blade path to keep blades sharp longer. To withstand continuous sawing and the weight requirement of larger logs. For easy loading of logs with a forklift or tractor, without having to drop or roll logs onto the saw bed. Provide improved durability and stability when loading, turning, and sawing heavy logs. For additional stability when clamping a log, cant, or a final board. Provide a smooth and stable track for the saw head to travel on. For simple leveling of the bed.